Callaway Rogue 4 Hybrid in good condition 21° loft Stiff flex Aldila Synergy shaft Lamkin Z5 grip Matching head cover Ball marks to the face Minor scratching to the sole Crown good - 1 minor mark high on the face but the top line is intact Shaft has a couple of minor scrapes but no bag rub Grip is in good condition Head cover is good - number missing - look at them and they fall out! Cash and/or collection available. Please - No offers. callaway rogue x hybrid stiff shaft 18 degree mint. Condition is Used. Dispatched with Royal Mail 2nd Class. Callaway Epic 3 Hybrid. Generic Callaway Hybrid Head cover included. Bought from Callaway Preowned in the USA but upgraded before it was used. Callaway Apex 3 Hybrid Stiff With Super Stroke Grip. Club is in good condition and fitted with upgraded recoil shaft in stiff flex. Bought to try but hybrids aren’t for me!!! Dispatched with eBay delivery – Shutl 1 day. Callaway X2 Hot Pro 2 Hybrid 18 Degree Aldila tour green Stiff Shaft. Head cover included Condition is Used. CALLAWAY ROGUE HYBRID. SYNERGY STIFF GRAPHITE SHAFT. GRAB A REAL BARGAIN FOR THE NEW SEASON . GENUINE ITEM. I WILL ASSIST IN ANY COMPENSATION CLAIM. GOOD SERVICE AND GOOD AFTERSALES CARE ARE MY TOP PRIORITY. Callaway Epic 2 Hybrid Left Hand Stiff Shaft Very Good Condition. Recoil shaft 780/F4 Purchased from new and only used for 1 round! Callaway Big Bertha. UST Mamiya Recoil 460 Stiff Shaft. One small bag rub mark on shaft (see photo) otherwise excellent condition. 2019 Callaway Apex Hybrid. 18 Degree with stiff shaft. Only played 1 round. Original Pom Pom Callaway Head-cover. For sale is my used Callaway Apex #3 Hybrid, 20 Degree loft with Kuro Kage stiff Shaft. High Ball Speed From A Forged Face Cup: The Forged Face Cup is made from Carpenter 455 Steel, and designed for increased ball speed at every impact location. Fujikura Speeder 865 Stiff Flex. 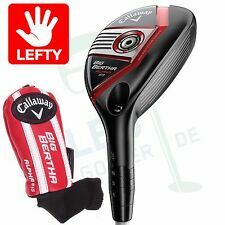 Callaway Big Bertha Alpha 815 #2 Hybrid. Head Cover: Included ( Callaway ). (All photos are of the actual club being sold). Grip: Mid Size Golf Pride Tour Wrap White. Condition Details. SHAFT:ALDILA SYNERGY 60HY. HEADCOVER:CALLAWAY ROGUE. MODEL:ROGUE X. GRIP:8/ 10. PICTURES ARE OF ACTUAL ITEM FOR SALE. 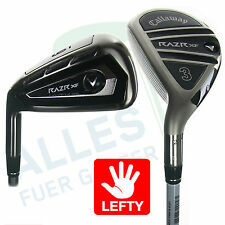 CALLAWAY EPIC HYBRID - 20 DEGREES REGULAR - RIGHT HANDED. SHAFT - recoil f3 (REGULAR). HAND - right handed. These clubs have been used but not abused. They will show normal wear from frequent play and may have natural scratches, pop up marks and/or bag wear on the shaft. CALLAWAY APEX HYBRID. Grip : CALLAWAY GOLF PRIDE MULTI-COMP. Model : APEX No'4 HYBRID. Shaft : KURO KAGE 80H STIFF. Flex: STIFF. The crown is in good condition. Shaft : 8/10 in very good condition. We will always go out of our way to source the product you are looking for. Shaft: Project X LZ 6.0. Club: Callaway XR Pro Hybrid. Cover: Callaway XR. Grip: Callaway. Driver, woods/hybrids and putter heads have light wear such as strike marks on the face from use and markings on the sole from general play. Callaway Rogue 17 Degree 2 Iron Hybrid. Stiff Synergy Shaft. Shaft: 8/10. Head: 8/10. CALLAWAY APEX #2 18* HYBRID WITH A KURO KAGE 80G STIFF FLEX SHAFT. Condition is Used. Callaway APEX hybrid #4. Callaway grip. Matching Callaway headcover. CATALYST 70 shaft. Stiff flex. Aldila Tour Green ATX75H-3.3 Stiff Flex. Callaway XR #4 Hybrid. Grip: Golf Pride Tour Velvet. (All photos are of the actual club being sold). Right Handed. Condition Details. Club Length: Standard. Length: 39.5". Callaway Epic 3 hybrid. Stiff flex. Complete with head cover. Good overall condition, as seen in pictures. Shaft : UST MAMIYA RECOIL ES 760 F4 STIFF. CALLAWAY APEX HYBRID. Grip : CALLAWAY GOLF PRIDE MULTI-COMP. Model : APEX. Flex: STIFF. Shaft : 9/10 in very good condition. Head : 9/10 A few very minor blemishes on the clubface but otherwise immaculate. Fujikura Speeder 865 Stiff Flex. Callaway Big Bertha Alpha 815 #2 Hybrid. (All photos are of the actual club being sold). Condition Details. Headcover: NOT Included. Club Length: 40.5". Shaft UST Mamiya Recoil ES 460 F4. Callaway Big Bertha OS 19 Degree Hybrid. Model Big Bertha OS. Shaft Material Graphite. Club Type Hybrid. Loft 19 Degree. Flex Stiff Shaft. Head: 7 - Good Shaft: 8 - Very Good Grip: 8 - Very Good. The club includes a CALLAWAY XR headcover. SHAFT:RECOIL ES 460 F4. HEADCOVER:CALLAWAY EPIC. WRENCH:NOT INCLUDED. TYPE:#3 HYBRID. GRIP:7.5/ 10. SHAFT:KURO KAGE 80HY. GRIP:8.5/ 10. WRENCH:NOT INCLUDED. HEADCOVER:NOT INCLUDED. CALLAWAY EPIC HYBRID - 20 DEGREES STIFF - RIGHT HANDED. SHAFT - recoil f4 (stiff). HAND - right handed. Although, the club is still in tact and ready for plenty of good golf shots. These clubs have been used but not abused. Shaft: Aldila Tour ATX. 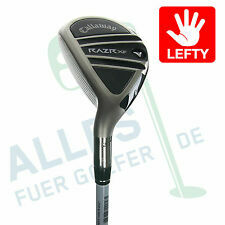 Club: Callaway X2 Hot Pro Hybrid. 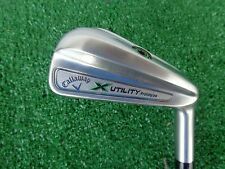 Callaway X2 Hot Pro Hybrid in good condition overall. The head has usual wear expected from use including marks on and around the crown but nothing of which affects play in any way. SHAFT: ALDILA TOUR. HEADCOVER:CALLAWAY APEX. MODEL: APEX. FLEX: STIFF. TYPE:4 HYBRID. GRIP:7/ 10. SHAFT:KURO KAGE 80HY. HEADCOVER:CALLAWAY APEX. GRIP:8/ 10. PICTURES ARE OF ACTUAL ITEM FOR SALE. Callaway Rogue Hybrid. Regular Shaft. SHAFT:KURO KAGE. GRIP:8/ 10. PICTURES ARE OF ACTUAL ITEM FOR SALE. Fujikura Fuel 95HB stiff flex graphite. X2 Hot Pro TC. "TC" TOUR ISSUE head. 18 degree Hybrid. Golf Pride Tour Velvet reminder. Head - 7, shaft - 9, grip - 9.